In March 2013, Chief Investigator KyL Cobb participated with another team in an investigation of the historic Birdcage Theatre in Tombstone, AZ. The history research for this location was created to prepare for this investigation. When one images the “wild West” of times gone by, one of the wildest towns was Tombstone, Arizona. Located in the extreme Southeast section of Arizona, in many ways Tombstone is as isolated now as it was in the late 1800s. In 1877 Ed Schieffelin was working at Camp Huuchuca as part of a scouting party monitoring the Chiricahua Apaches. During his free time, Schieffelin would set out in search of his fortune along the hills east of the San Pedro River. The area was rugged, waterless and barren. The only real inhabitants at that point were the Apaches and they were often at odds with the white settlers. While working a high plateau named “Goose Flats,” Schiefflen discovered a rich vein of Silver ore. 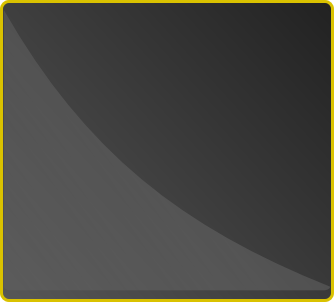 The silver boom drew people to the desert region. By 1879, the town of Tombstone was established and by 1881 over 1000 people lived in the village. By 1882, over 5,000 people (maybe as many as 15,000) lived and worked in Tombstone. There were over one hundred saloons, numerous restaurants, a large red-light district, an even larger Chinese population, schools, churches, newspapers, and one of the first public swimming pools in Arizona. The influx of wealth and people in the town brought technology to remote Tombstone. Amenities such as refrigeration (with ice cream and later even ice skating), running water, telegraph and limited telephone service became readily available. The employment boom brought by the silver mines brought people from all over the world. Many of the workers that came to Tombstone were foreign. The mines were worked by Irish and Germans while the service industries such as laundry, construction, restaurants and hotel staff were primarily Chinese. The money flowing into Tombstone also brought with it criminal elements. From cattle rustling to Con men to professional gamblers, Tombstone was the place to make a quick fortune. The lawless attitude in Tombstone led to the famous showdown at the O.K. Coral between the Earps and Clantons on 26 October 1881. It was in the shadow of the O.K. 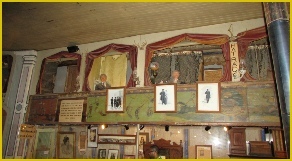 Corral shootout that the Bird Cage Theatre was opened by William "Billy" Hutchinson and his wife Lottie on 25 December 1881. The name referred to the fourteen “cages” called “cribs” that hung from the ceiling of the main floor. These “cages had drapes that could be drawn closed while the “ladies of the night” entertained their customers. While the theatre did have stage entertainment, respectable ladies never went to the Bird Cage. In 1882, Joe and Minnie Bignon purchased the theatre and change the name to the Elite Theatre. Shortly after the name change, the name returned to being the Bird Cage. When the Bird Cage opened it was in the midst of the Silver Boom and the New York Times reported that "the Bird Cage Theatre is the wildest, wickedest night spot between Basin Street and the Barbary Coast." Various stories assert that as many as 26 people were killed in the Bird Cage. Over a hundred bullet holes still remain in the building confirming its reputation. A prostitute called "Margarita" was murdered by one of her co-workers called "Gold Dollar". According to legend, Gold Dollar caught Margarita sitting on the lap of Gold Dollar’s boyfriend Billy. In a jealous rage, Gold Dollar stabbed Margarita in the chest, killing her. Gold Dollar fled out the back door, hiding the knife as she ran. Because the murder weapon could not be found, no murder charges were filed. In the late 1980s, the double-edged stiletto was discovered behind the Bird Cage. For the next 8 years, the Bird Cage never closed. Day or night there was a poker game to be found or a whore working in the basement. In fact, the ongoing poker game never broke-up, continuous play for its entire eight years while it was open. Some of its more famous poker players included Doc Holiday, Bat Masterson, Diamond Jim Brady and George Hearst. Once mines were tapped out and water began seeping into the mines, the Bird Cage, like Tombstone itself, gradually died. In 1889, the theater closed and was sealed up. In 1934, the Bird cage building was purchased. 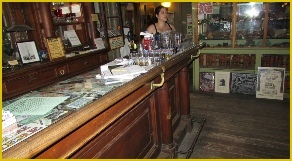 Most of its contents from 1889 were still intact including its saloon bar, poker tables, furniture, chairs and pictures. Soon the entire building became a museum of the old west. 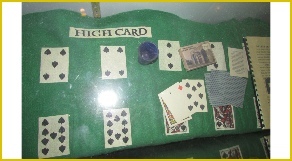 Photo of Henry “Doc” Holliday’s faro table in the Bird Cage.